Jacob Powroznik works to land one of his 36 bass today en route to winning the Knockout Round at Lake Chickamauga. When time ran out in the Knockout Round at the first Bass Pro Tour event this year, Mike Iaconelli wasn’t too pleased about finishing 11th. At the second event, he wound up 21st in Group A, less than 2 1/2 pounds from getting into the KO Round. At Raleigh a couple weeks ago, he made the Knockout Round, but wasn’t a factor to advance to the Championship Round. 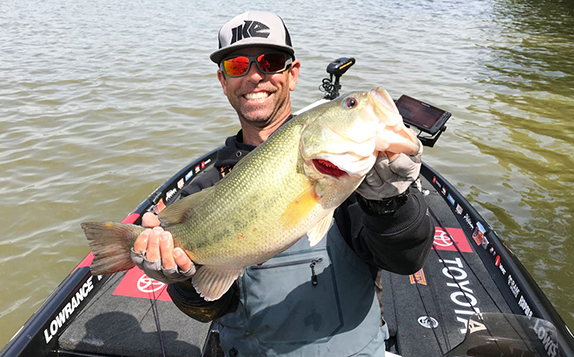 Behind a furious third-period comeback today, Iaconelli will be among the 10 anglers heading back out on Lake Chickamauga on Sunday to finish what’s been a catch-fest of a tournament. Iaconelli was 22nd after the second period Saturday before catching 13 fish for 31-04 over the final 2 1/2-hour segment. In the last 30 minutes alone, he racked up 23-03 which included a 6-03 and a 4-01 within two minutes of each other. He said he’d fished the same stretch earlier in the day and he’s certain others did as well, so he wasn’t expecting to catch what he did. 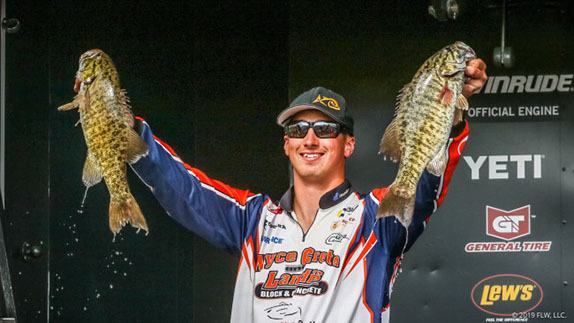 His late-day rally carried him to a 3rd-place finish with 59-08 (28 fish), trailing only Jacob Powroznik and Todd Faircloth once everyone reeled their line in for the final time. As a result, he’ll get to compete on Sunday for the first time this season. With weights zeroed for the final round, he doesn’t anticipate changing much about his strategy. By securing a top-10 finish, he’s mathematically clinched a berth in the Heritage Cup, the second of four MLF Cups to be contested later this year. Mike Iaconelli was all smiles after a wicked third-period flurry carried him to a berth in the Championship Round. Powroznik caught at least 20 pounds in all three periods and finished with 67-14 (36 fish) to assure himself a chance to win back-to-back events. Faircloth trailed him by just over four pounds as he tallied 63-12 (31 fish) with 33-06 coming in the first period. To complete the gauntlet on Sunday, someone will have to outperform Edwin Evers (four-time finalist and winner at Lake Conroe), Powroznik (winner at Raleigh) along with Dayton natives Andy Morgan and Michael Neal. Powroznik is fishing with a ton of confidence right now because this is the time of year he excels. Like Iaconelli, he doesn’t see himself straying from what’s worked so far. He feels his success this week is due to his fishing shallower than most others. If he’s to win a second straight event, he thinks it’ll be sticking with that game plan. “It’d be awesome (to win again),” he said. “I started with a 1-in-80 shot at it. Now, it’s down to 1-in-10. 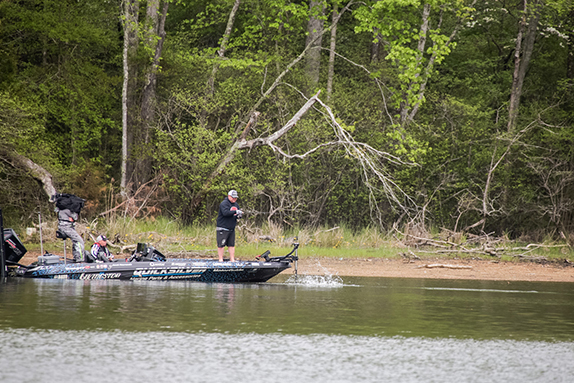 Iaconelli wasn’t the only one to surge into the top 10 in the third period. Points leader Evers caught 22-04 (12 fish) to jump from 21st to 9th where he finished with 50-15 (27 fish). 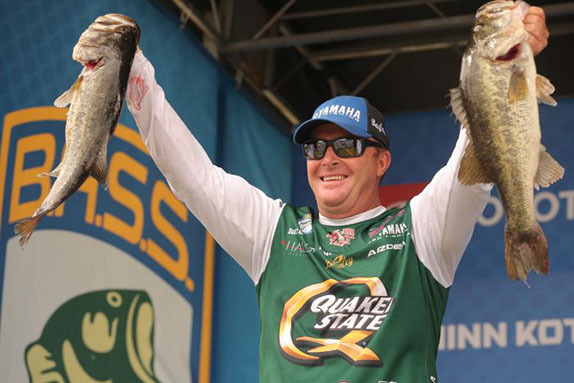 He’s now 4-for-4 in qualifying for the final round this season, the only BPT angler to do so. Jared Lintner continued his strong season by surging from 19th to 8th in the afternoon, thanks to a tournament-best 8-10 kicker that anchored his 22-10 third period. Getting bumped out of the top 10 in the final period were: Jacob Wheeler (5th to 15th), Dave Lefebre (7th to 19th) and Aaron Martens (10th to 25th). Faircloth came into this week 15th in BPT points, but he’d yet to make a Championship Round. His massive first period went a long way in helping him finally reach one. 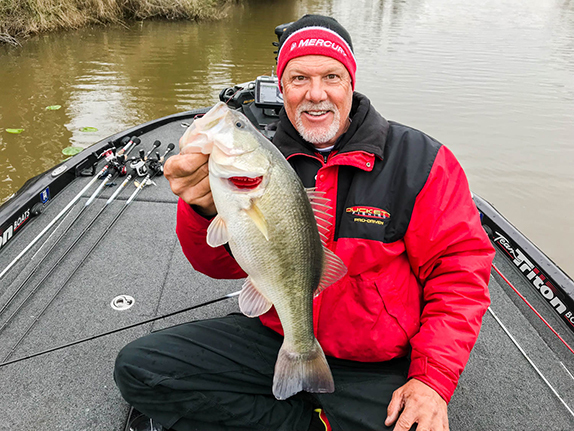 Faircloth tangled with a quartet of 3-pounders in the first period as he picked up in the area where he left off Friday. That was important as it allowed him to sample a part of the lake that he felt wasn’t getting as much fishing pressure as where he’d been fishing. Rain passed through the area during the second period today, then it cleared up, but more rain is on the way as scattered thunderstorms are expected to move in tonight. Morning storms are predicted for Sunday with close to a half inch of rain in the forecast along with winds in the 15 to 25 mphs range. > Additional details will be published shortly. > Day 5 stats: Period 1 – 360 fish, 666-06; Period 2 – 271 fish, 498-13; Period 3 – 243 fish, 462-13; Total – 872 fish, 1,623-13. The following anglers missed the cut and will not compete in the Championship Round.